Hey there! We hope you had a fun week and if you are looking for a sweet way to cool off this summer or planning your next summer bash we’ve got three great frozen recipes for you! Making frozen desserts seems intimidating at first, but in reality it’s pretty simple and the results are stunning (and an unexpected surprise for guests). We love these recipes because not only will they help you cool off, they are all summer themed! Frozen Grasshoppers with Mint Fudge Sauce – the sweet and refreshing combination of mint and chocolate come together perfectly in these perfect little frozen treats from Random Sweetness. And the best part of this recipe: you only need 7 ingredients! Frozen S’mores – Nothing says summer camping like s’mores! But we’d suggest enjoying this frozen version by Reading Confetti at home! Frozen Strawberries & Cream Dessert – Strawberries and summer go hand in hand. 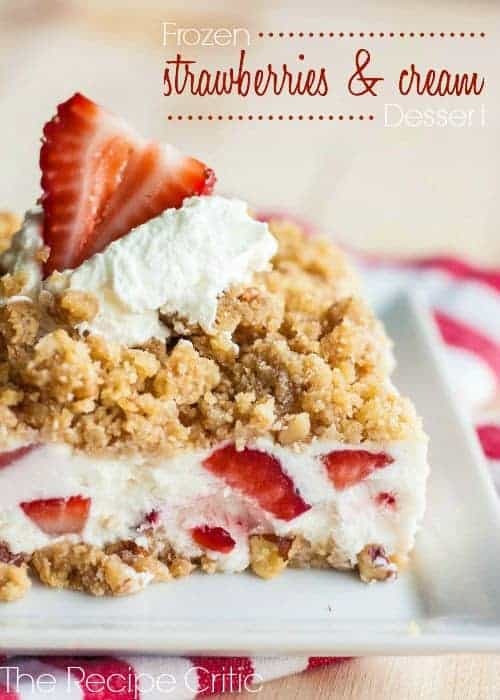 If you love the perfect pairing of strawberries and cream give this delicious frozen dessert by The Recipe Critic a try! What are your favorite frozen summer treats?